My daughter may only be 15 months old, but she’s already become an adept iPad user. Whether it’s watching videos to learn sign language or flipping her way through her favorite ebooks, Apple’s tablet is very much a part of her play routine, alongside wooden blocks and stuffed animals. App maker Benjamin Bellity thinks there more that can be done on the iOS platform for toddlers like my daughter. And he’s got the app to back up that assertion. The app, Babiis, made its debut this week at Macworld | iWorld. Think of it as a messaging app for the two-and-under set. The app hosts videos of family members—parents, far-flung grandparents, or whomever you want—displaying the video icons on a family tree-style interface. When your toddler taps the image, the video plays, showcasing whatever greeting, story, or message that person recorded. Babiis records toddler reactions as they watch video greetings from family members. 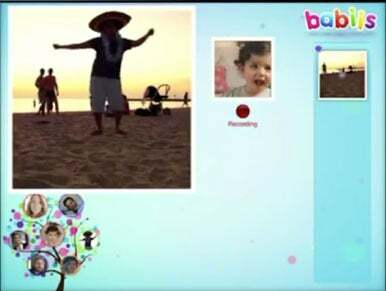 But while the video is playing, Babiis also activates the front-facing camera on the iPad 2 to record your toddler’s reaction to the video. Later, you’re able to forward your child’s hopefully delighted response to grandma and grandpa’s video via email. In addition to its messaging feature, Babiis also debuts with a handful of games, aimed at teaching kids letters, numbers, and animals. Tap a letter in the letter game, and the app will say what the letter is. Again, there’s a personalization aspect to the games in Babiis—parents can record their own voices saying the letters, numbers, and animals, so that your child can learn from a familiar voice. Bellity plans to add one or two games each month, making them available as in-app purchases. Babiis is a free download, with no current limits on the number of people that can be in the family tree. Over time, however, that will be capped at five people, with the ability to unlock other spaces with an in-app purchase. The app currently works only on the iPad, with plans to develop an iPhone version down the road.